Hi, I'm looking for as much information on cone flowers as possible.I'm just getting started in gardening,and I've always liked cone flowers.How many different colors are available and what do I plant with them. That's a very broad question. I would recommend doing a google search on echinacea. In general, in recent years there have been many new cultivars created. They are a native wildflower, very hardy and very drought tolerant. Welcome to the forum! Boy, I'm really with you on this one because I love Echinacea (coneflowers) too! Of course, I've always been attracted to Daisy-like flowers. Here's a list of the Echinacea I have in my garden beds and their colors. I'm really not sure yet, but I may have lost my Echinacea 'Hope'; however, it will be replaced because a portion of the purchase price goes to help fight breast cancer and it is dedicated to the memories of those who have perished to breast cancer and the survivors. There is also another new one this year but I don't recall the name of it. I believe the leaves are kinda speckled. Here's a picture of some of my Echinacea 'Magnus' and 'Little Giant' (top center with flat petals. I had no idea there were so many varieties of cone flowers! I really love the way they look and plan to use some in my new flower beds. Can someone tell me how long they stay in bloom - long or short? Also, do they do well in afternoon sun? I'm noticing some flowers aren't faring well in the beds with the hottest sun of the day. Thanks! Joanne, there are so many different varieties available now and they keep adding more each year. It's wonderful and so exciting! By the way, I made a mistake on my list because I still have 'Rubin's Glow', but 'Ruby Giant' should have been on my Wish (or replacement) list. Last year, during a bad storm, a huge limb fell on one of my of my beds and I lost some of my flowers, but I think most of the damage came from the men working to cut up the limb and remove the debris. Can someone tell me how long they stay in bloom - long or short? Also, do they do well in afternoon sun? Joanne, mine are blooming now and I'll still have flowers in the fall. As far as sun requirements, I have some of mine in full sun, while others are in beds that get either morning sun or afternoon sun and all are doing very well. I'm noticing some flowers aren't faring well in the beds with the hottest sun of the day. Are you talking about newly planted flowers? I've found any newly planted flowers seem to struggle until they've been in the ground for a while and get their roots established. I try to plant my flowers when were expecting rain or cloudy days instead of sunny days. I've got several of those plastic storage crates and if it gets too sunny I place one of those over the plant and lay a small piece of plywood, painted white, on top of it. It seems to work great because the sun get reflected off the top and the plant gets air so heat doesn't build up! Thanks for the info Patches! I do have one purple cone flower, that was a transplant from a friend, that seems to be doing better now that it adjusted. I have two beds that other flowers seem to wilt in and think adding a bunch of coneflowers is the answer. Hmmm, another excuse to go to the nursery. Joanne, I don't think you can ever go wrong with coneflowers. I was at Lowe's this morning with a friend and they had the 'Ruby Star', which is on my Wish list, in a gallon pot for $5.97. It was a really good-size plant, but I passed it up! We had other places to go, so I didn't think it was a good idea to leave it sitting in a hot car, but I may go out there this afternoon and get one! Patches, I saw the "Ruby Star" at Lowes also but had already picked one up along with "Magnus" and "White Swan". Mine weren't nearly the size of the ones at Lowes though! I didn't see "White Swan" on your list, is it a newer one? For Patti - my sunset today just before the rain. I didn't see "White Swan" on your list, is it a newer one? Joanne, my list is NOT a complete list of all the available varieties of coneflowers, just the ones I have and the ones I want. 'White Swan' is not new this year so it's probably been around for a year or two. Thanks for the welcome Dodge! I had no idea coneflowers do well in the shade. I have tons of shady area to plant and will be sure to add them to the list. Most Echinacea require full sun, although 'Vintage Wine' will tolerate partial shade. All of mine are planted either in full sun or else they get complete morning or afternoon sun without any impediments. Once I planted several varieties in dappled sun and they did not perform well at all so I had to move them or I was afraid I was going to lose them. I would recommend checking for the sun/shade exposure on the label. Thanks for the heads up Patches. I might try a few in different areas and see if anything does well. I have a whole lot more "part shade" than I do "full sun" on my property and really want flowers that I enjoy. I hate spending money on something just because it has the right "requirements" although I tend to like things more once they are actually in my garden. Dodge, do you have any planted in shade and if so, which varieties? Thanks! Hi everyone.Now that I know how many different colors of coneflowers are out there,what can I plant with them to get killer combinations? what can I plant with them to get killer combinations? Since I love coneflowers I think that anything you plant with them will give you a killer combination. I have them planted with dasies, garden phlox, lilies, bee balm, clematis, etc. Actually, your choices are endless! I was just showing SIL yesterday how to cut seedhead off and showed where the others were cut and they'd branched forming more stems for blooming. so is'Angel'really fragrant?Is it a smell you can smell near it or do you have to stuff your nose in it? I have an area out front it receives full sun I was thinking about putting in a cone flower. I had a bush die (needless to say I was anything but disappointed) So now I can plant flowers in that spot. I have been trying to figure out what to put there and coneflowers were on my list. I think I am gonna go for that. Do you think they will do ok in an area where a dead bush was removed? Here is my area, I will be putting them in the middle you can see the dead bush there. If I had my way their would be no bushes at all but hubby likes them. I guess the bush is not dead in that pic, but the center one has died. We have a bed like this on each side of the drive way. I think coneflowers in the center would really set if off. It doesn't matter where you go in life... It's who you have beside you when you get there. Yes, I guess there is if your name is Hope! I think 'Hope' is very pretty and it's such a soft, pale pink. The pink seems to make it look very dainty, at least, to me it does! Actually, I find with 'Angel' you really have to get your nose down there to smell it! Of course, I'm finding that out about the lot of the flowers they say are fragrant. Talking abt fragrance... i wonder if location o soil affects it...i bought a packet of Nicotiana seeds fr Thompson & Morgan sometime ago...they were said to have "intense evening fragrance"...well..since i collect fragrant flowering plants..thot i'd try 'em...outta packet only 2 plants survived..1 has yellowish-green/greenish-yellow? flowers n da other is white...they bloom o.k..BUT NO FRAGRANCE at all?? n i also have an Abraham Darby rose blooming now...when i first gotit...the fragrance was...eemmmm no words to describe...really loved it! !..but da few flowers on da plant now...well da fragrance is not s intense s when it first arrived...anybody in da know abt this??? Karrie, what other flowers were you planning on planting with the coneflower? Are you only going to plant one coneflower? Their will be a bush on eithor side of the coneflower, and then I have put zenia in the front of the bushes. Their is not alot of room out there just where the middle bush has died. I was looking at the gallon sized buckets they had at lowes. I wanted to get one in red and one in yellow to put out there together. They will be close of course. I wanted to get one in red and one in yellow to put out there together. Karrie, are you talking about a red (Echinacea) coneflower? yeah here is the link to the ones I like, I thought the combination would look nice out there. Sorry...I had to delete your link. It was way too long and ran the page over. WOW! I've NEVER seen 'Twilight' before and it's gorgeous! I'm was familiar with 'Harvest Moon' and considered getting it at one time, but I wasn't in the market for another gold-yellow flower at that time. Is that the yellow one you're talking about? Kerrie, if you're thinking of putting those two together I think it would look awesome! I would love to see some pictures when you get it done. I think I will go for it. I have never had coneflowers so I have been trying to decide, and that area is in a place where it gets full sun, its hard to water, so I was thinking they or daiseys were the way to go. Thanks for the advice on the matter. As soon as I get pictures worth takeing I will make sure to post. Kerrie, since you already mentioned that you were thinking about daisies I was wondering if you ever considered putting Shasta Daisies in front of the coneflowers? Actually, I do that a lot, and I think it's a great combination since the daisies help hide some of the stark bareness of just the green leaves on the conflower. 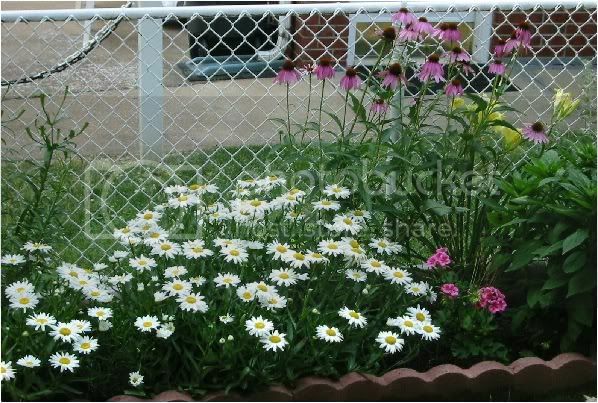 Here is a picture from the front of some of my Shasta daisies with some coneflowers in the background. I think the white also helps to brighten up the area and draws your eyes to it. 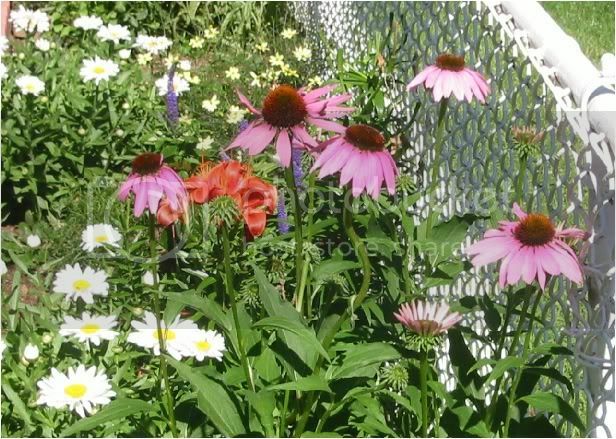 You can also see some of my daisies with some coneflowers (from a different angle) on page of this topic. Kerrie, this is just a suggestion and my two-cents worth! That is a wonderful idea Patti! Thanks for your input! Kerrie, I'm so glad you liked the idea! Now, I'm anxious to see what it looks like when you get it planted. I think it's going to be a beautiful combination with those vibrant red and yellow coneflowers and the brightness of the white Shasta daisies. It might not look like much the first year or two, but once it fills in it will be a show-stopper! Of course, Now that I've got the picture in my mind I'm trying to figure out where I could do that combination in my yard, without the shrubs. I love the color of 'Twilight'! I hate the shrubs. They were here when we bought the house. They were all over the place. I got my husband to concent to moveing the one rignt in front of the poorch but not the ones around the house. We dug up those 3 and 3 others and moved them to that area by each side of the drive way. I wish they would all die.....he he he you know why. But they do offer a lil protection for what flowers I do plant. Those 2 on each side of the cone flowers will help aid in wind protection a little bit. Those 2 on each side of the cone flowers will help aid in wind protection a little bit. You're right about that, Kerrie, because the wind can sure damage the coneflowers. I've went outside after many a storm only to find mine blown down and broken off. Of course, these were the taller ones (36-40") and I don't think that as much a concern with the two you're getting since they only get about 24". I think that's one of the reasons I'm attracted to the shorter ones now. Patches, do you know of a place to look up how tall each one will get? The tags on mine all have generic info and I'm not sure how to place them in the new bed. So far I've picked up Magnus, White Swan, Double decker, Red Ruby (or is it Ruby Red?) and Rocky Top. I also want to put in black eyed susan, Arizona sun blanket flower and petite delight bee balm but don't want anything to get buried behind something taller. Thanks! I've never heard of 'Ruby Red' or 'Red Ruby', but there is a 'Ruby Star' and 'Ruby Giant'. As you can see 'Ruby Giant' is shorter but it's named for the 7" flowers it is supposed to have. Unfortunately, mine have NEVER gotten that BIG! Joanne, it's been my experience that you can't always rely on the height given for any plant. I've had to move many different plants over the years because whenever I've planted the shorter plant in front and taller one in back they didn't grow that way! So it's moving time again! Thanks Patches, that's what it was... Ruby star. Looks like all of the coneflowers will be in the back. I appreciate the info! You're welcome! Joanne, I hope you will post some pictures when you get everything planted because it sounds like you've got some nice flowers to go along with coneflowers.